It’s been 4 years – more or less – since frugalfeeding’s beginning. And what better way to commemorate my catalogue of over 400 recipes than with cake? 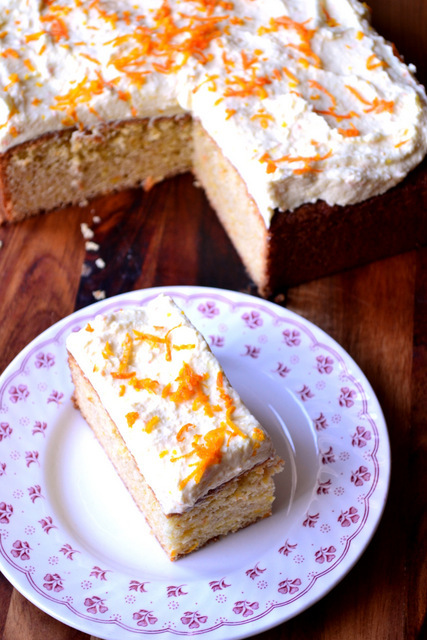 An Orange Spice Traybake to be precise, finished with an indulgent layer of mascarpone cheese, infused with fresh orange and sprinkled with vibrant zest. Inspired by the one and only Mary Berry, my Orange Spice Traybake is flavoured primarily with an orange, boiled for half an hour, blended and thrust wholly into the mix. Where we differ? Mary’s sweet tooth, raging unabated despite advancing years. Sickly sweet cake doesn’t do it for me. It’s unnecessary. You lose all the flavour of the cake behind a sugary veil. It’s not a problem inside a Victoria Sponge, but when you have spices and an orange waiting to steal the show, it’s disappointing to mute their performance. The result is quite a “grown up” cake; a hint of sugar darting about behind the scenes. Firm but moist, the sponge possesses an easily recognisable orange element, with a pleasing, but subtle, bitterness arising from the retained peel. 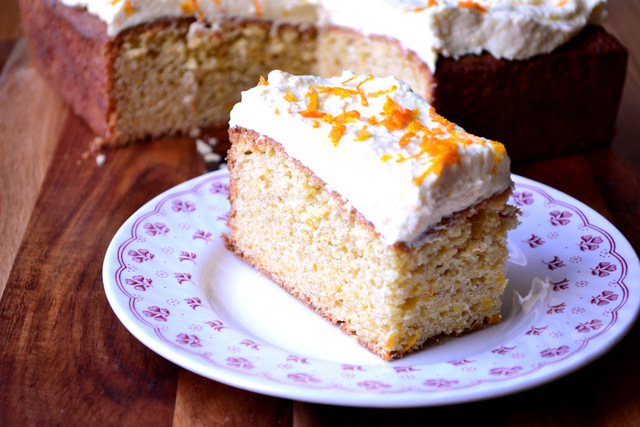 Finally, the creamy, indulgent mascarpone icing, delicately flavoured with blended orange and decorated similarly, is welcomed with every mouthful. Alone, the sponge would be delicious, but the mascarpone helps keep things light throughout. Place a large orange in a saucepan and cover with boiling water. Simmer for 30 minutes until soft. Chop, blend and set aside. Preheat the oven to 180C/160C(fan). Grease and line a square baking tin (22x22cm). Cream together the butter and sugar. Beat in the eggs thoroughly, one by one. Fold through the flour, baking powder, blended orange (saving 2 tbsp) and the spices. Tip the batter into the prepared tin and bake for 45-55 minutes, until golden brown and cooked through. A knife, when inserted, should emerge clean. After 10 minutes cooling, turn out your cake and transfer to a wire rack to cool completely. Meanwhile, cream together all the ingredients for the icing and beat until thickened. Using an electric whisk helps. Place in the fridge until the cake is ready to ice. Once everything is appropriately chilled decorate your cake. Spread the icing liberally on the top and finish with a little fresh orange zest. Serve with optional party hats. Cost: Traybakes, not always iced, are often the cheapest cakes to make. 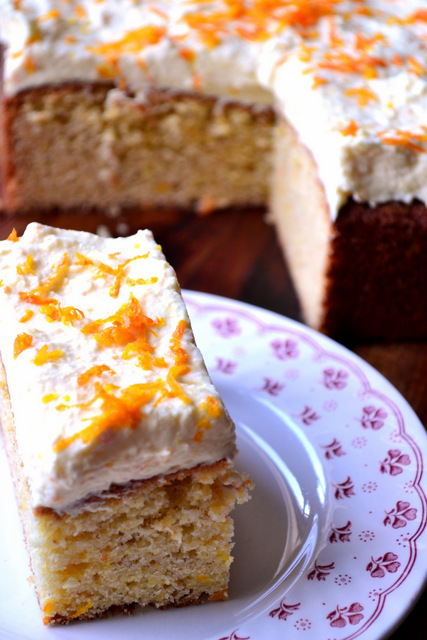 This Orange Spice Traybake is a little different; a result of the mascarpone. But it shouldn’t set you back more than around £4.50. If you’d like to reduce the price of the cake by over £1, while retaining the decoration, full-fat cream cheese will happily stand in for the mascarpone. But don’t expect it to be as creamy. This looks absolutely lovely and there’s something about citrus this time of year! For one thing, it’s usually at a low price and I think the bright flavor helps when everything outside seems so grey and dull! Thank you, yes I seem to be on a bit of a citrus “thing” at the moment. I’m enjoying it a lot. Congratulations – and I wish I’d held off making my very plain cupcakes until I’d read this! Nothing wrong with a plain cupcake! Still delicious. I like this recipe and will try it soon. Agree wholeheartedly with “sickly sweet” comment. Cake, generally, doesn’t need quite so much sugar! It just doesn’t. All parties need hats. I do have my fingers crossed for sunshine. I’m bored of the cold weather. Normally you would have had me at ‘orange’ and ‘spices’ but then you went and mentioned the bitterness of the peel. Bleurgh. 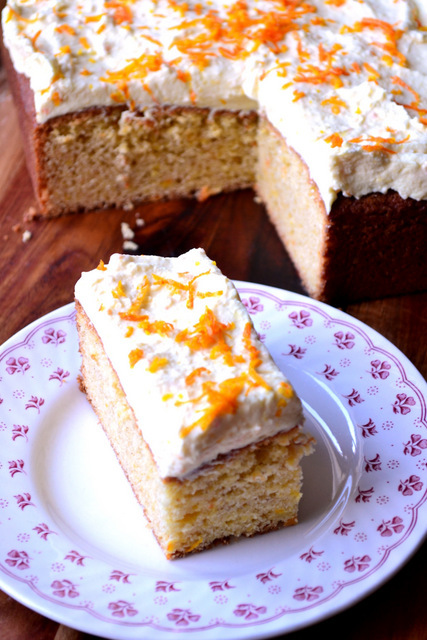 I have tried many a cake with whole oranges in it (Tom Kerridge’s being the last victim) and I can’t do it. The bitterness really isn’t very pronounced. I think you’d be pleasantly surprised! Congratulations on FF’s fourth anniversary – big milestone. I’m a big fan of Mary, for sure. Thank you very much. I’m in agreement with you on cakes that are too sweet. You had me at Mascarpone! I’m a huge fan of mascarpone, especially in icing. A very happy birthday to you blog! Excellent! Glad you like frugalfeeding so much. I hope you try out some of my recipes. This sounds so delicious. On my list for our next family gathering. Congratulations, Nick on four years of Frugal Feeding! I am not surprised at 2 million views – you and the quality of your recipes certainly deserve it! Thank you, Cathy. Yes, let’s hope it continues and perhaps gets even better! Well done on your four years! Thank you, I’m still enjoying it! Congratulations, well done Nick on your anniversary. Great site, posts, bog, pics & the most amazing, quality, inspiring recipes that we all enjoy. Here’s to the next Four Years, wishing you well in all that you may choose to do, I’m certain that the best is still yet to come, I’ll be saying, ‘I told you’! Orange Spice Tray-bake is delicious, a great recipe-especially for a ‘grown-up cake’, as I do have a sweet tooth, however it tastes beautiful & your correct, less sugar does allow the flavors of the orange, spices & creamy mascarpone topping to shine through perfectly. Haha – thanks. Well, let’s hope so. I certainly be continuing! First, congratulations on 4 years of blogging and all those delicious recipes that you have shared with us. I agree with you, some cakes are way too sweet…this orange one sounds terrific. Thank you, Karen. I’ll continue to share as much as possible :). Thank you very much, I’m so happy you like my writing. I hope you continue to visit! Hi Nick, what a wonderful blog you have created with fab recipes. And the pictures ….. are so pretty. Espec this one. ….and the blood orange one …. and the apricot choc one ….. ooooh I love them all! Thank you. I am going to make this one tomorrow! Thank you – I hope you enjoyed.